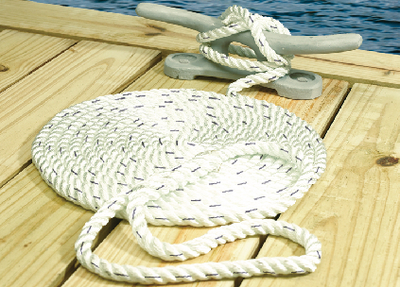 Extremely strong rope with 10" eye splice (1/2" rope: 18" eye splice). Designed to absorb sudden shock loads. Very good resistance to abrasion, rot, oils, gasoline and marine growth. Clamshell packed. White with contrasting blue tracer.